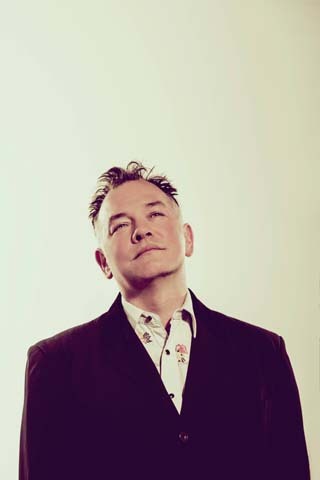 Stewart Lee interview. The comedian in conversation prior to the performance of his new stand-up show 'Content Provider' at Scarborough Spa, 2017. 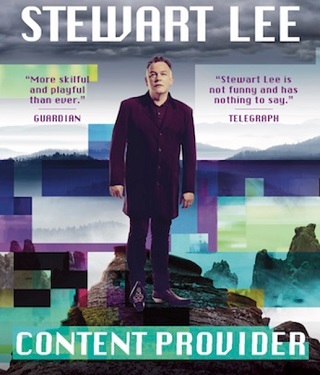 Comedian Stewart Lee is on a brand new tour, his first since the award-winning ‘Carpet Remnant World’. Caroline Feather chatted to him about the new show ‘Content Provider’ ahead of his performance at Scarborough Spa, which comes to the venue’s theatre on Wednesday 4 October. I’m ok, but I got bitten by a spider during the previews of this new show and ended up in hospital for a week. They knew what it was at A&E immediately – a false widow. They came to the south of England about a hundred years ago but the winters normally kill them off. Because of climate change there is a population explosion and a lot of people are getting bitten. Donald Trump and Paul Nuttalls need to tell the spiders there is no climate change and then maybe they’ll stop biting everyone. You’ve been a stand-up for 28 years now, and you’ve won every award going. How do you find the will to keep going? Well, duty to the kids drives me forward. And it’s all I can do. I write more material than any other comparable stand-up, and I cover a lot of ground on the tours every year, but I am getting worn out. I started writing the new show in June and then the Brexit happened and obviously you can’t not mention it, but I found myself staying awake for about a week trying to work out what was going on so I could work it into the set. In the end I realised nothing was going to change that fast and backed off a bit. Brexit and Trump have made comics’ lives hard though. How people are behaving is beyond satire, so what do you satirise? Your new live show is called ‘Content Provider’. What can people expect? Will it be the same as your BBC2 series Comedy Vehicle? Or will it be different to it? It’s very different. Comedy Vehicle was four series of six thirty minute, self-contained sets. This is one two hour through line, although I’ve had to keep the ideas and structure a little less rigid than usual to cope with the sudden surges in news events. There is also an apparently meaningless set which is actually very subtle and cleverly linked to the themes of the show in a way which becomes clear over the evening. It is made entirely from the second hand DVDs of other stand-up comedians, none of which I paid more than 10p for. Other comedians’ DVDs are currently the cheapest building material in the world. Other shows you have been involved in have been very controversial, like Jerry Springer The Musical. Is the new show shocking? It was Jerry Springer The Opera, not the musical. Richard Thomas composed it. I don’t really understand this question but this show is I suppose ‘less shocking’ than usual. I think my core audience is having a bad time at the moment – they are the sort of people who will be depressed about Brexit and Trump – so I feel it’s time to cheer them up, not engage in terrifyingly dark black comedy. The world is bad enough. Your BBC2 show was cancelled in February after ten years and four multi-award winning series. Were you surprised? Not really. The BBC is facing massive cuts due to the government trying to systematically dismantle it, so something had to go from the comedy slate. Also, I’d done about all I could with that format. The truth is, financially I am better off touring that amount of material for two years, making a live DVD and then selling it to Netflix than I am giving more material away to BBC2 for less money. I am 48 with two kids and doing a job with no pension plan so I need to be realistic about making hay while people want to have my hay. You’ve been described as ‘the comedian’s comedian’. Is that flattering? I don’t think it’s the case. Most of the younger comedians seem to hate me, I think, and because I’m not really on the club circuit any more, and do my shows in theatres, I’m not part of any community and none of the new ones know or see my stuff anyway which is good I suppose, because if they did they would give up. What advice do you have for young people trying to be comedians? Well, it’s the same as with acting or music. It isn’t like 30 years ago. If you’ve got rich parents you might be ok, if you haven’t don’t bother. Every loophole that allowed people to subsist financially while working out their schtick has been closed and all the opportunities are controlled by the same production companies. It’s a closed shop now that is only open to the wealthy anyway. Do something else. Lots of them are dead or unknown, but here’s twenty. Lenny Bruce, Bill Hicks, George Carlin, Chris Rock, Eric Bogosian. Jerry Sadowitz, Ken Campbell, Dave Allen, Ted Chippington, Kevin McAleer. Nish Kumar, Harry Hill, Daniel Kitson, Bridget Christie, Paul Sinha. Johnny Vegas, Simon Munnery, Michael Legge, Josie Long. Well I’m touring this ‘Content Provider’ show until 2018. I’m supposed to be making a folk rock album with the group Trembling Bells at some point. I wrote a comedy drama about Brexit in September that is currently with a production company trying to find someone who’ll pay to make it. I’ll write another book for Faber, this one about doing stand-up on TV. But I need to slow down. I have no life and no friends. I don’t do enough with the kids. After the tour ends in the summer of 2018 I’ll lie on the sofa for a bit and watch ‘60s Italian westerns. They’re all I’ve watched for the last few years really. I’ve seen nearly 200. I like them because the directors and writers tried to slip weird and interesting and political things into them under cover of the movies being genre. I suppose that’s what I try to do with stand-up. At the end of the day it’s still just comedy, but maybe you can make it meet something better half way.